Our range of products include satin printed labels. 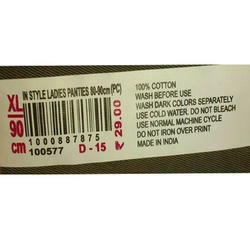 Owing to our expertise, we are offering to our valuable clients an excellent quality Satin Printed Labels. The offered product is manufactured using best grade material and latest technology in different designs for our clients. It is custom made satin printed size labels at 15 paise per SQ. inch. Our offered labels are available at competitive prices. We are involved in producing an exclusive range of Satin Printed Labels. These products are made using best quality inputs and tested on various quality parameters in order to ensure their optimum quality. Apart from this, we offer these labels within a committed period of time at very reasonable and pocket-friendly prices. Looking for Satin Printed Size Label ?